The interview, by guest blogger Jo Walters and posted by Emily Bates, describes Al’s new book, Face to Face: Up Close to Mother Nature. 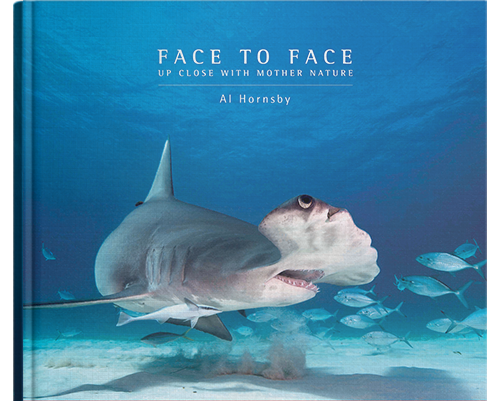 Read the full story: From Tiger Sharks to Nile Crocodiles, Al Hornsby’s New Book is Wildlife at Its Wildest, which includes a special offer of a signed copy of Face to Face at a discounted price, plus a US $5 donation to Project AWARE’s marine environmental efforts for each book sold. Al, as one of the founders and the original executive manager of Project AWARE Foundation, is a staunch supporter of Project AWARE’s current mission objectives, “Protecting Sharks & Rays” and “Combating Marine Debris.” Visit Responsible Shark and Ray Tourism: A Guide to Best Practice for more information on Project AWARE and its citizen-involvement and donation programs. Al’s writing and photography are featured in the October 2015 issue of Sport Diver (UK) Magazine, in Big Animal Encounters, covering “The Great White Sharks of Guadalupe,” “The Mantas of the Maldives,” “The Whales of Tonga” and “Croc Diving in Botswana.” Additionally, Al’s Great White Shark images appear in Sport Diver’s October 2015 special edition, World’s Best. Looking for Al’s new book? An interactive section that deals with photography, journalism and current projects. © Al Hornsby 2016-2018 | Website managed by WP Sifu.